The narrative for this year's conference championships is pretty clear: it's all about the offense. This season had the highest offensive levels in league history. The final four teams are the top four teams in scoring, and rank as four of the top five teams in offensive DVOA. The AFC Championship is a rematch of a game that ended 43-40. This NFC Championship is a rematch of a game that ended 45-35. But it's not a fait accompli that this year's NFC Championship Game is guaranteed to be a non-stop shootout. 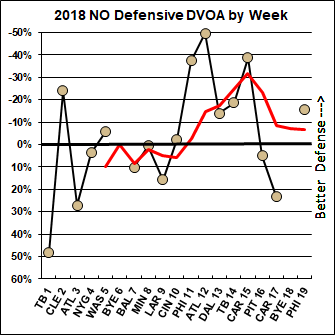 Because while the Saints' numbers for the season show a superior offense and a mediocre defense, the numbers for the past few weeks show something very different. The Saints have improved dramatically on defense, while taking a step backwards on the offensive side of the ball. And while the Rams give up a lot of yards, they can bring plenty of havoc on defense too. After all, they employ the likely Defensive Player of the Year, Aaron Donald. Including the playoffs, the Saints and Rams are both 7-0 at holding a one-score lead in the fourth quarter this season. For the Saints, that includes the first meeting of these teams back in Week 9, which you can read about here. The Saints have relied on a league-high seven game-winning drives and own the best record in close games (those with a Q4 comeback opportunity) this season (8-1). The Rams (8-2) have the second-best record in close games in 2018. Both teams kept their offensive level constant in late and close situations (second half, score within eight) and both teams saw their defensive DVOA improve in these situations. If they keep this game close until the fourth quarter, we could be in line for an all-time classic. For those who may be unfamiliar with the Football Outsiders stats, they are explained at the bottom of the page. Scroll down or click this link. Game charting data appears courtesy Sports Info Solutions, unless noted. All stats represent regular season only, except for weighted DVOA and anything else specifically noted. If you have FO Premium, you can click here to see all the matchup of DVOA splits for this game. Let's start with the big matchup of strength against strength: the Rams' running game against the New Orleans run defense. Now, the Rams' offense is not as run-focused as you might think. In the first half of games, before we get into teams with the lead running out clock, the Rams only run on 40 percent of plays, which is about the league average. But nobody ran as well as the Rams this year. In particular, nobody run-blocked as well, or came close. The Rams set a new record with 5.49 adjusted line yards per carry. But they also led the league in rushing DVOA overall, and in second-level yards (gains that come 5-10 yards past the line of scrimmage). On the other side, the Saints finished second in defensive ALY and third in run defense DVOA. The success the Saints had against the run came from all over the formation. They allowed conversions on just 57 percent of short-yardage runs, third in the league, but they also ranked first preventing second-level yards per carry and third preventing open-field yards per carry. The top three Saints in combined run tackles were linebackers Demario Davis and A.J. Klein, and safety Vonn Bell, and they all made their average run tackle closer to the line of scrimmage than the average at their positions. There's some question about how much the Saints' run defense will be hurt without defensive tackle Sheldon Rankins, who tore his Achilles last week against the Eagles. Based on our individual defense stats, Rankins was more a player who sucked up double teams so other Saints could make plays, rather than a penetrator who took down running backs himself. Most starting defensive tackles had more combined run tackles than his 25, and his average run tackle came at 2.5 yards which is actually above-average for defensive tackles. The Saints ranked only 17th in ALY up the middle, compared to their rank in the top three for runs listed as left end, left tackle, or right end. The Rams offense wasn't spectacular on runs around the ends, but they were No. 1 in ALY on runs up the middle or behind left tackle, and they ran more left tackle runs than any other team in the league (21 percent of runs). Most everyone who watches the NFL closely knows at this point about the Rams' love of 11 personnel: one running back, one tight end, and three wide receivers. They use this same personnel group on nearly every play, or at least they did for most of the year. In the final two weeks of the regular season, the Rams were suddenly using a lot more tight ends, particularly in 12 personnel. Did that continue in the divisional round? It looks like it did not. The Rams did have four plays with 12 personnel and four more plays with 13, but five of those eight plays came when they were running out the clock in the fourth quarter. The Rams' love of 11 personnel brings good news and bad news for Saints fans. The good news is that the Saints' run defense really shined against 11-personnel runs, allowing a league-low 3.6 yards per carry. The bad news is that the Saints were not very good against 11-personnel passes. They allowed 6.9 net yards per pass attempt, 28th in the league, and a 47 percent success rate, 27th in the league. This split emphasizes the general issue with the Saints defense, which is that it was much better against the run than against the pass. However, the pass defense has turned around substantially in the second half of the season. In the first six games, the Saints had 35.7% pass defense DVOA (31st in the NFL) and allowed 7.8 net yards per attempt (30th). Since trading for Eli Apple and benching Ken Crawley in Week 8, the Saints have -6.6% pass defense DVOA (fifth) and allow 6.5 net yards per attempt (16th). That improvement since Week 8 also means improvement against passes from 11 personnel. Since Week 8, those passes have gained just 6.2 net yards per attempt. That's still 22nd in the NFL but it's better than New Orleans' full-season numbers. Things are even better if we look at the eight games since the first meeting with the Rams. Since Week 10, passes from 11 personnel have gained just 5.4 net yards per attempt, eighth in the league. Another place where the Saints improved after the Apple trade was in their splits covering wide receivers, especially No. 2 receivers. For the season, the Saints were 30th against No. 1 receivers and 31st against No. 2 receivers, allowing over 80 yards per game to each. But since Week 8, the Saints rank 18th against No. 1 receivers and tenth against No. 2 receivers. However, there is another split where things didn't improve as much for the Saints when the rest of their defense improved. Overall for the entire season, the Saints ranked ninth in DVOA against short passes but dead last against deep passes (16+ yards in the air). If we only look at things since Week 8, the Saints improve, but not that much: now they are 27th against deep passes. The Rams only threw five deep passes in the first Saints game -- compared to their season average of seven -- but they connected on four of them for an average of 29.3 yards. The Saints defense ranked 11th with a 31.3 percent pressure rate. If we only look at games since Week 8, that improves to 36.3 percent, fifth over that period. The Rams offensive line was fifth among the lowest pressure rates allowed, at 25.9 percent. Cameron Jordan led the Saints with 48 pressures, third in the NFL behind Donald and Dee Ford. He was followed by Alex Okafor (25.5), rookie Marcus Davenport (20), the injured Sheldon Rankins (18.5), and backup defensive tackle David Onyemata (15.5). Onyemata tends to play passing downs but will get more work on standard downs with Rankins out. Overall, getting to Goff is a good way to go for the Saints on Sunday. Every quarterback sees his numbers drop under pressure, but Goff also sees his rank among quarterbacks drop under pressure. Under pressure in 2018, he averaged 3.3 net yards per pass, including scrambles (20th out of 34 qualifying quarterbacks) and a 27 percent success rate (25th). In the first matchup of these teams, the Rams offensive line appeared to win out on the pressure battle. The Saints had 11 pressures, for a 25.6 percent pressure rate -- almost exactly equal to the Rams' season number. There were no sacks by either team in the Week 9 game. Goff was one of four quarterbacks this year to average over a yard more against man coverage (9.3) than against zone coverage (8.0). Goff had a lower interception rate against man coverage, but a higher sack rate. The Saints played man coverage 40 percent of the time, zone coverage 48 percent of the time, and a combined coverage 11 percent of the time, which is a split roughly close to the league average. One other strategy we have to talk about when we talk about the Rams offense: play-action. The Rams use play-action more than any other team in the league: 34 percent of pass plays according to Sports Info Solutions charting. They gain 9.0 yards per pass with play-action (third in the NFL) compared to 7.1 yards per pass without it (seventh). The Saints allowed 1.1 yards per pass more when opponents used play-action, which was about the league average. 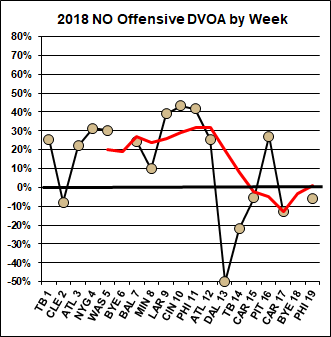 The Saints' late-season offensive slowdown is one of those trends where we always have to stop and ask ourselves: real trend, or random variation that we're seeing as trend? First of all, throw out the Week 17 game when Teddy Bridgewater started instead of Drew Brees. Even without that, the Saints have had four negative offensive DVOA games in their last five. The numbers are really dragged down by the 13-10 loss to Dallas in Week 13, but for the most part the Saints simply haven't played up to their previous offensive standard in the last month and a half. Here's a closer look at the offensive numbers in the first 11 games compared to these last five (again, tossing out the Week 17 game). As you can see, the decline here is all about Brees and the passing game. Real trend? Our old buddy Doug Farrar thinks so, writing an all-22 study of what's gone wrong with Brees' game over the last few weeks. Doug tags the primary culprit as a problem with Brees' mechanics under pressure. Like Goff, Brees saw his numbers drop significantly under pressure, more than the average quarterback. For Brees, it was more about the yardage. Brees gained just 2.6 net yards per pass attempt (including scrambles) when he was under pressure, 29th out of 34 qualifying quarterbacks. The Saints managed a 34 percent success rate with Brees under pressure, which ranked 13th. That's a better rank than in raw yardage, but still a much lower rank than Brees' performance overall. However, the drop in Brees' performance in Weeks 13-16 wasn't necessarily related to pressure. Yes, there was more pressure. The Saints ranked second in the league in lowest pressure rate allowed, but their pressure rate allowed went from 20.3 percent of pass plays through Week 12 to 29.3 percent of pass plays in Weeks 13-16. Even with this drop in his performance without pressure, obviously it is a lot better to get pressure on Brees than not. And the Rams led the league with a 36.0 percent pressure rate. The danger with the Rams is pressure up the middle, as Aaron Donald lapped the field with a league-leading 62.5 pressures and 20.5 sacks. Next to him is Ndamukong Suh, second on the Rams with 28 pressures. Two outside pass-rushers, Dante Fowler and Samson Ebukam, also had at least 25 pressures each. Perhaps because they are so good in the front three, the Rams go against Wade Phillips' historical tendencies and don't blitz much. They only blitzed on 20.6 percent of pass plays this season, 21st in the league. It might make sense to blitz Brees more, since Brees this year was much better against a standard pass rush. For the entire season, Brees averages 8.0 yards per pass against a four-man rush and 6.6 yards per pass against a blitz. Both numbers have dropped during Brees' recent decline -- although last week, SIS only recorded the Eagles blitzing Brees three times, and Brees was 3-for-3 on these passes, including a 2-yard touchdown. However, blitzing didn't necessarily work in the first Rams-Saints meetup. Brees was 9-for-12 with an average of 7.2 yards per pass on blitzes. The other thing that didn't work in the first meeting: covering Saints No. 1 receiver Michael Thomas. With cornerback Aqib Talib out with an injury, the Rams counted on their other starting corner, Marcus Peters, to take on Thomas in man coverage. And Thomas destroyed the Rams with 211 total receiving yards. Against zones, Thomas caught 5 of 7 passes for 75 yards. Against man coverage, primarily by Peters, he caught 7 of 8 passes for 136 yards. Over half that yardage came on a 72-yard touchdown (24 yards in the air, 48 YAC) that gave New Orleans a 10-point lead late. Peters had a slightly below average success rate this year (49 percent, 56th among qualifying corners) but what was really bad was his tendency for getting burned deep (9.7 yards per pass, 80th). Peters allowed completions on seven plays with 20 or more air yards; only six cornerbacks allowed more such plays. Talib's raw charting stats aren't fabulous, but they are better than the stats for Peters: 8.4 yards per pass, 52 percent success rate. And Peters was targeted three times as often in twice as many games. The Saints' receiving corps is sometimes criticized as Thomas and a bunch of nobodys, but with Drew Brees throwing them the ball, those nobodys were highly efficient. It's outstanding for Thomas to have 23.1% receiving DVOA over 125 catches, but Tre'Quan Smith had 22.7% receiving DVOA and Keith Kirkwood had 23.5% receiving DVOA. Ted Ginn had a poor season, when healthy, with just -21.6% DVOA, but it was just a year ago that Ginn finished second among qualifying receivers with 34.8% DVOA. One of these receivers is going to be covered by Nickell Robey-Coleman on each play, and Robey-Coleman was excellent as the slot cornerback, allowing just 4.4 yards per pass with a 67 percent success rate. Like the Saints, the Rams have a stronger defense against short passes (sixth in DVOA) than against deep passes (22nd). Brees' accuracy on deep passes, like everything else, has been a problem since Week 13. In Weeks 1-12, he connected on 58 percent of deep passes. Since Week 13, including the divisional round, he has connected on 43 percent. The Rams rank fifth in DVOA against tight ends, but the numbers are interesting: Los Angeles is efficient, but also tends to face a lot of passes to tight ends. The Rams allow an average of 67.0 yards to tight ends per game (compared to the league average of 52.7) but also rank fifth in lowest catch rate allowed (62 percent) and were tied for the league lead picking off eight passes intended for tight ends. The Rams are fourth in DVOA against running backs as receivers. Alvin Kamara had only four catches (on five targets) for 34 yards in the first matchup, though one of those catches was a 16-yard touchdown. Surprisingly, the Saints use play-action at a frequency below the league average, just 19 percent of pass plays. They gain 8.3 yards per pass on play-action, just 11th in the league. However, this is a good game for the Saints to run more play-action than usual, because the Rams allowed 8.8 yards per pass on play-action, worse than any defense except Green Bay. The Saints, like most teams, use more personnel diversity than the Rams. The Saints used 11 personnel on a little over half their plays but also used 21, 12, and 22 personnel each on at least 8 percent of plays. The big heavy set was the least successful of these personnel groupings. The Saints had 4.4 yards per play and 44 percent success rate from 22 personnel. Each of the other three groupings averaged at least 6.2 yards and a 50 percent success rate. And the Rams defense was strongest against... 22 personnel. It was only 35 plays, but the Rams allowed just a 40 percent success rate with 3.5 average yards. Run defense is a significant weakness that the Saints can take advantage of. As noted earlier, the Rams were just 28th in run defense DVOA. The Saints were eighth in run DVOA and second, behind only the Rams, in adjusted line yards. The tiny decline in the running game at the end of the season looks more like random variation than the significant decline in the passing game. One last weird little split that I discovered from this season. The bigger the lead that the Rams have, the worse their defense gets. This suggests that it's easier for the Saints to get back into the game if they fall behind early. Note that these numbers don't conflict with what I wrote at the start about the Rams improving on defense in late-and-close situations; that average defense when tied or up 1-8 becomes -46.7% defensive DVOA when tied or up 1-8 points in the fourth quarter. On the surface, the Saints had a better year on special teams than the Rams did, but that's entirely a product of the injury to Rams kicker Greg Zuerlein in Weeks 2-6. If we remove Zuerlein's replacements, the Rams would move up from 17th to ninth in special teams DVOA, with the Saints ranking 10th. For the most part, each team's relative strengths cancel each other out. Wil Lutz missed only two field goals all year, but Zuerlein has been plenty good in past seasons and has a stronger leg. (Zuerlein was 6-for-9 on kicks over 45 yards, while Lutz was 4-for-5.) The Saints got more value on kick returns, mostly when Alvin Kamara took a few of them late in the year, but Zuerlein had more gross and net kickoff value than Lutz. The Rams (JoJo Natson) were slightly better on punt returns, but the Saints had slightly better punt coverage. Johnny Hekker, who was our No. 1 punter of 2016 and No. 3 punter of 2017, had a bit of an off-year, ranking just 11th in gross punt value and 13th in net punt value. Not that we're expecting a lot of punts in this game. Heck, even if these teams line up to punt, they may not punt. Hekker runs more fakes than any other punter in the league, and the Saints have Taysom Hill around to play upback or run gadget plays. Look for the game to start out exciting from the get-go: the Rams rank 28th in defensive DVOA in the first quarter before improving to 12th from the second quarter onward, while the Saints are 31st before improving to sixth from the second quarter onward. Picking this game depends a lot on how many weeks you think makes a real trend. I think most of us accept that the improvement of the Saints defense since the Eli Apple trade is real. That's over ten weeks of data. The decline of the Saints passing game has come in just Drew Brees' last five games. Is that enough evidence to accept this decline as "real?" Keeping the Rams' passing game down is a tough assignment, even for a defense that's been strong against the pass like the Saints of the last three months. It's still going to be hard for the Saints to outscore the Rams unless Brees has a strong game and reverses his recent downturn. But if the Drew Brees from the first three months of the season is on the field Sunday, the Saints are the better team because they clearly have the better defense. My gut feeling is that specific matchups and the unknown of the Saints' passing slump give the Rams a better chance to win this game than the Vegas line or the top-line DVOA ratings would suggest. If you balance that out with home-field advantage, you still end up with a 50-50 tossup. And I think this game is closer to 50-50 than 60-40 Saints. Each team is listed with DVOA for offense and defense, total along with rush and pass, and rank among the 32 teams in parentheses. (If the DVOA values are difficult to understand, it is easy to just look at the ranks.) We also list WEIGHTED DVOA (WEI DVOA), which is based on a formula which drops the value of games early in the season to get a better idea of how teams are playing now (explained here). 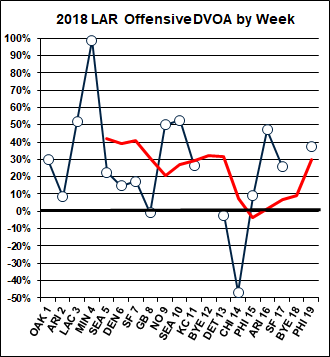 Each team also gets two charts showing their performance this year, game-by-game, according to offensive and defensive DVOA. In addition to a line showing each game, another line shows the team's trend for the season, using a rolling average of the last five games. 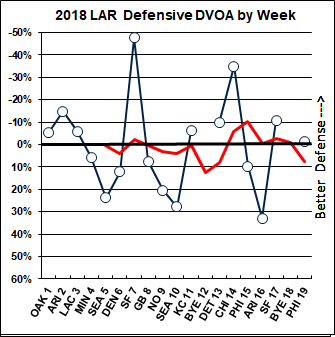 Note that the defensive chart is reversed so upwards is a more negative defensive DVOA (which is better). The Rams DVOA graphs list the week 19 opponent as the Eagles and not the Cowboys. (And since I hate just leaving a negative nitpick, I'll add that the playoff previews are some of my favorite articles that FO does). When we say "the Saints' offensively slumped last 6 weeks of the season", what we're really saying is Brees' production slumped while his star left tackle's been out injured, right? And a couple other O-line dinged, but left tackles get the big bucks for a reason. Good point, and based on last week's game I would say Brees usually can put it together in the PO's (over 70% Comp.% and a Rating over 103. Plus he has maintained a Rating over 100 for 14 PO games. He is the Best Pure Passer I have ever watched in the NFL, especially when you consider his height compared to most. ..and Bushrod moved back to the bench, where he can't get anybody hurt. :) I'm sorry to be mean, but he was overrated when he was in his prime - now, he's a vulnerability. ** - Armstead tried to play against PIT week 16, but had to leave the game after re-aggravating his pectoral. Bingo. Brees seemed less confident and more rushed when his entire line was banged up. If the numbers don’t show a higher pressure rate, that’s probably because he was getting rid of the ball fastr than he would have liked. A Rams fan started a petition to get Bill Vinovich replaced as lead game official because the Rams are 0-8 with Vinovich since 2012. Is Brees done like Manning was done in the second half of 2014? Obviously I hope not, but it's a possible parallel. Seriously, Mountain, you could see Manning's physical deterioration. I don't see it in Brees yet. Edit: not very much anyway. I suspect Manning's decline is at least partly due to his neck injury. Brees has not had a significant injury in yeardd.